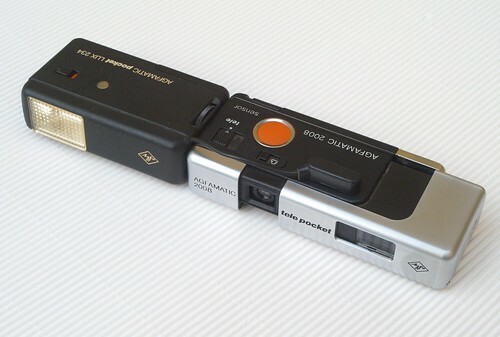 The Agfamatic 2000 pocket sensor is a 110 cartridge film pocket camera made by Agfa and designed by Schlagheck & Schultes, introduced in 1973. Sun & Cloud weather symbols selects between 1/100 and 1/50s shutter speeds. Flash is provided by magicubes. As all of the pocket Agfamatics it has the push-pull film advance, meaning that closing and opening again the camera once after an exposure causes the film to advance to the next image frame. The significant noise caused by that mechanism made the pocket Agfamatics popular as "Ritsch-Ratsch-Kameras" in Germany. Another typical pocket Agfamatic quality is the camera's red mechanical "sensor" shutter release button. The Agfamatic 2008 pocket sensor was a later variant with flipflash socket instead of rotating magicube connector. 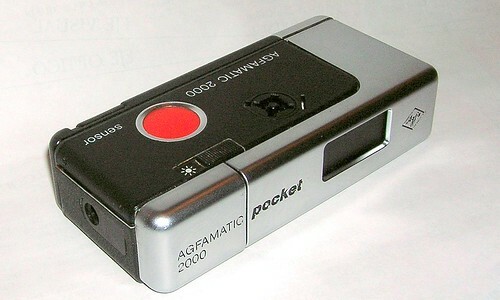 The Agfamatic 2008 tele pocket sensor was a further variant with tele mode. In tele mode an additional lens element is shifted in front of both, the Color Agnar lens and the reverse Galilean optical bright frame finder. This page was last edited on 21 April 2017, at 05:10.